We usually think of trays as tools to serve food with. But they've also been used, very successfully, as decorative elements in every room of the house, including the bathroom. Putting items on a tray makes your countertop look neater and more organized, and it gives you the chance to develop a "theme" that fits with your decor style. 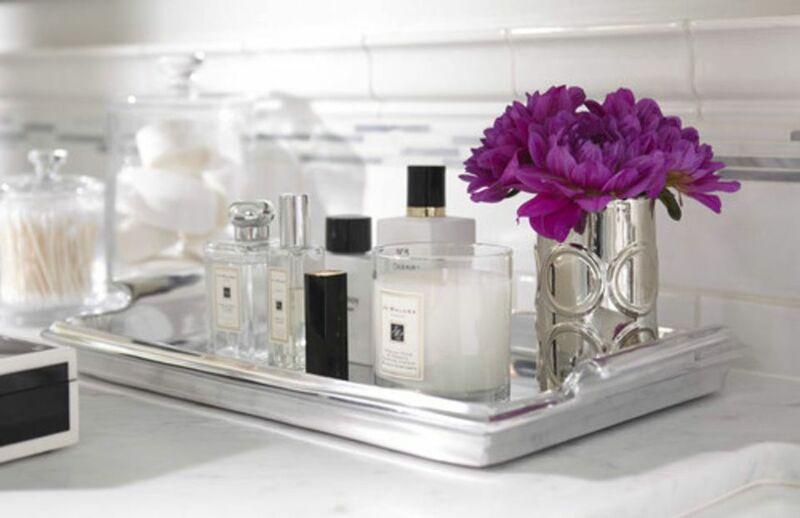 In this example, a space by Urrutia Design, a silver tray holds a simple flower, a candle, perfume, and some makeup items. The silver vase for the flower is perfect for the tray, as well. This tray feels luxurious and indulgent, something you would find in a sophisticated woman's bathroom. Trays are great to keep all your fragrances together. Get a tray that fits the style and colors of your decor. For example, this retro-style bathroom with painted brick and vintage vanity features a beautiful, handmade-style mirrored tray by Glitter Guide. The tray can easily be picked up and moved to another location, and the handmade style really suits the rest of the decor. Who's your style inspiration? Keep them on your mind with a tray decorated like this one, by Torie Jayne. A cheeky photo of Marilyn Monroe, surrounded by fresh peonies and retro, 50s jars for perfume and bath salts make this tray a subtle yet powerful homage to the famous icon. 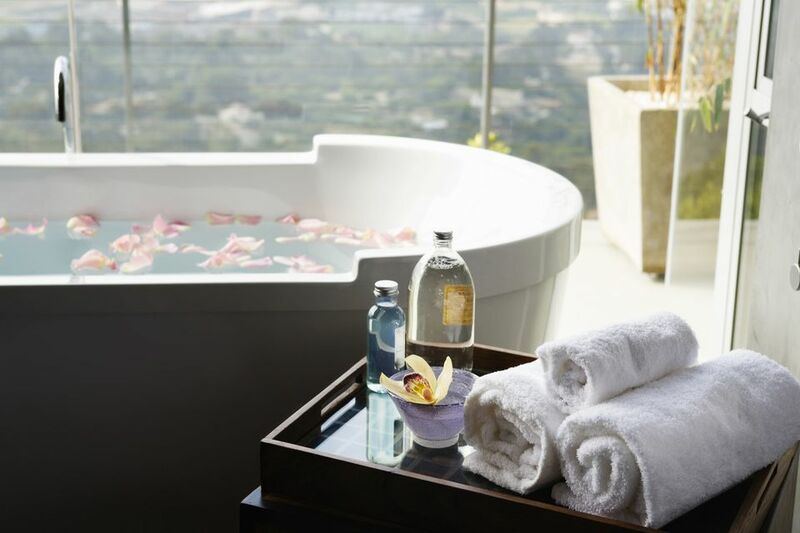 Set next to a retro freestanding tub, it is the perfect decoration. Looking for something a little more modern? Try this minimal white lacquer tray, decorated by Rosa Beltran Design. The minimal edge profile means that your tray will not take up too much visual space; however, the black and white contrast with the soapstone countertop makes it very visible anyway. A chevron soap tray defines an extra space within the bigger tray and is used for keeping jewelry. An elegant office paper tray made of leather actually finds a fit home in this bathroom by Ashley Winn Design. The contents are simple: candle, fresh flowers, a mirror, and some hand towels. White makes a great contrast to the brown leather and brings out the silver reflections of the studs all along the tray. A mirrored glass tray has a kitschy side that can suit the right kind of decor. But this example from Susan Glick Interiors is the opposite of kitsch: classy, understated and beautiful. A bouquet of fresh white roses, a small picture, and some fragrance bottles fill it up. Notice how the glass jars of all kinds add light effects when placed on a mirrored surface. This pretty silver tray, decorated by Erika Brechtel, shows how you can add a touch of exoticism to your bathroom without having to change everything. The delicate silver filigree along with the Moroccan bottles (very cute) have a foreign touch that's just irresistible. The addition of a frame in the back adds a lot of style, too. This simple but elegant tray by Becki Owens is filled with everyday items like makeup brushes, matches, hand towels, fragrances, and lotions. The brush jar and tissue box have a pretty, filigreed finish that adds visual interest. The tallest items are placed in the back so you can easily reach for anything you need. 100 Layer Cake shows us how to style a simple wooden tray with decorative jars, dried flowers, and a geode. The neutral color of this tray will suit any bathroom, and handles make it easy to move it to another area of the counter if you need to. As they suggest, use opaque canisters to hide less attractive items that you still want close by. If you lack space on your counter, why not use the toilet tank as a storage/decor space? In this bathroom by The Order Obsessed, a simple oval pewter tray set on the tank holds a candle, fragrances, and lotions. It's a simple decorative touch that works really well when you don't have enough counter space to hold a tray. A delicate elegance defines this retro silver tray from Home 2 Me. Retro glass jars, apothecary bottles, and beautiful fresh flowers work together to bring a sense of relaxation and luxury. This is the perfect setup for a more traditional style bathroom. In this bathroom by Kara Mann, the tray serves as a complement to the antique beveled mirror. While the overall style of the bathroom is modern, the mirror and tray add a dash of old-time luxury. The white and gold jars and boxes on the tray are especially well chosen to finish the look. This rustic dream bathroom, found on Happiness Is Homemade, features a beautiful and practical multi-level tray for hand and finger towels, lotions, and beauty items. This tray keeps the space organize and adds a little more storage capacity for smaller vanities. A dash of pink in a black lacquered Chanel tray adds color to this modern, monochrome bathroom by Dresner Design. This tray announces the owner's love of classic fashion brands and certainly adds personality to a minimalist, modern bathroom. For a glamorous, exotic touch, try this faux python patterned tray, by Bliss At Home. The tray is simply decorated with a candle, hand lotion, and white roses. On an all-white countertop, the tray becomes a visual point of interest. A vintage kitchen tray transforms this bathroom with extra practical storage space and a dash of quirky styling. This tray, found on Little Vintage Nest, keeps practical items such as washcloths, soaps, and oils, as well as a bouquet of fresh flowers set in a mason jar. Vintage style can be pretty and dainty too! And if you thought that only rectangle trays were pretty, think again: this hexagonal aqua tray, styled by Kyle Knight Design, is just the perfect kind of original. It's unexpected, the shape contrasts the the rectangles around it, and the color is subtle enough not to distract from the natural beauty of the marble.